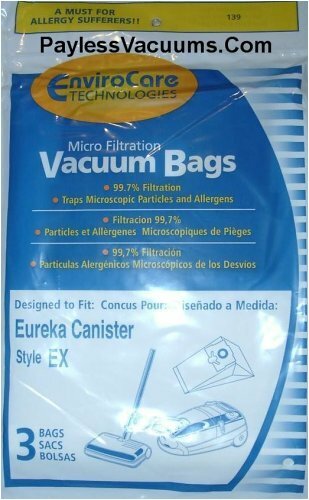 EnviroCare Technologies Micro Filtration Vacuum Cleaner Bags EUREKA Style EX which are designed to fit ALL Eureka canister vacuum cleaner models on the market that take a Style EX bag. These bags are a must for the allergy sufferer or anyone that does not like dirt and pollens coming back out into the home. These bags provide 99.7% filtration through the bag alone and will trap microscopic particles and allergens. The Filtration Efficiency of these bags being almost 100% compared to as low as only 20% in standard bags which will allow you to notice a great amount of reduction in dusts and pollens inside your home. For a cleaner home environment buy these EnviroCare Technologies Microfiltration bags today.